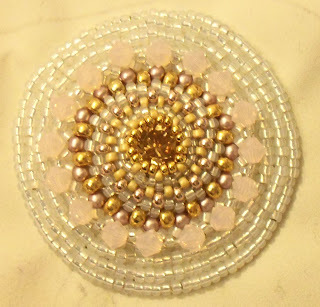 So, it's been a couple of weeks since I posted the progress on my beaded bag... I have made a bit of progress! 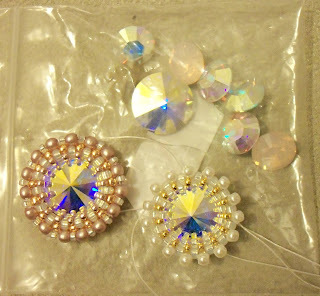 First off, I've removed one of the chatons that I had initially attached... I just didn't like the way it looked. 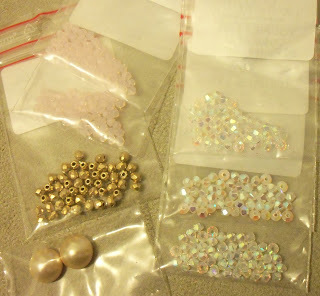 I knew that I wanted to make the rest of the chatons stick up less from the surface of the bag... so I have developed a new way of beading them! 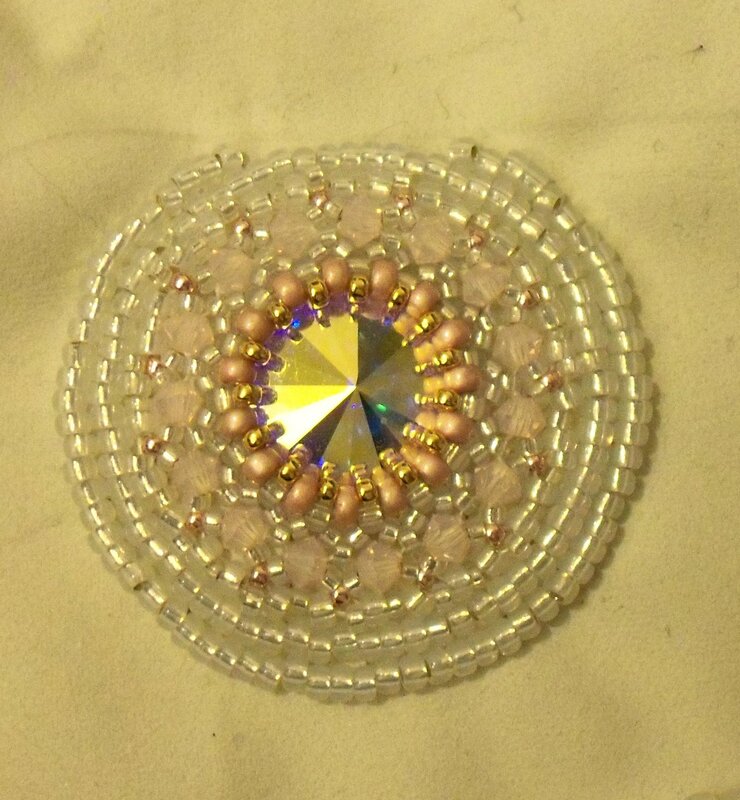 Instead of making a quick bezel for the chaton, and sewing it onto the backing, I've started doing more beading around them, then sewing the whole component on. This component is an 8mm chaton, surrounded by several rows of circular peyote, then a ring of 4mm bicones, in 4 different shades of white and crystal... then a few rows of embroidery in gilt-lined opal. 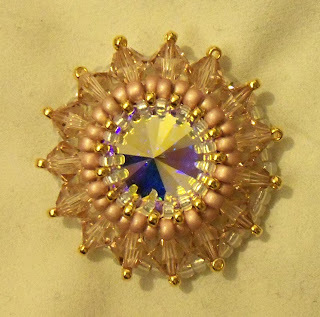 This element is super-sparkly, surrounded by antique rose swarovski bicones, with little gold size 15s highlighting the end of the crystals. 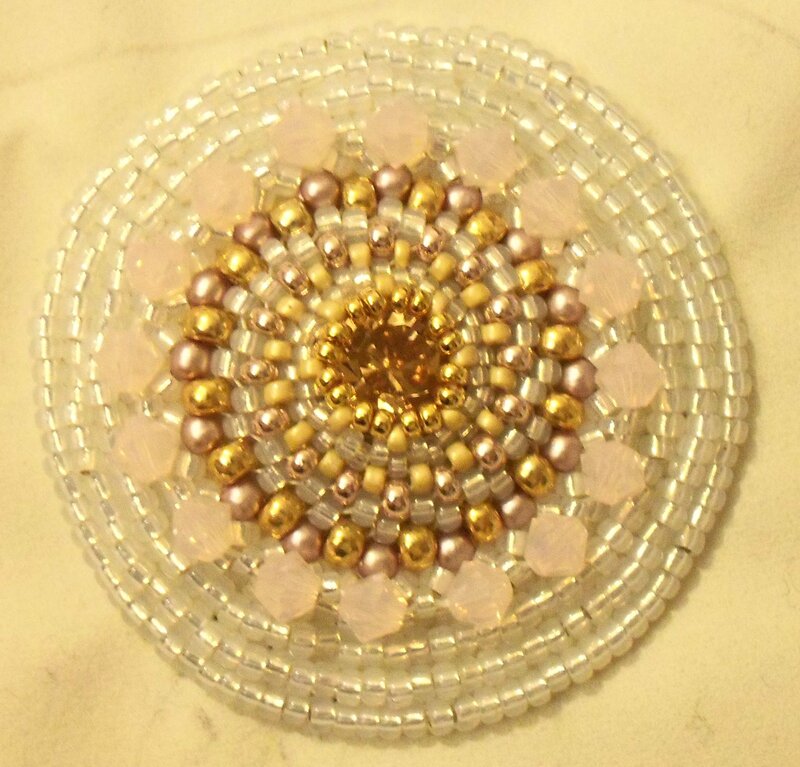 A light-colarado topaz chaton is at the centre of this element, with plenty of rose-water opal bicones surrounding the circular peyote piece holding the chaton in place. 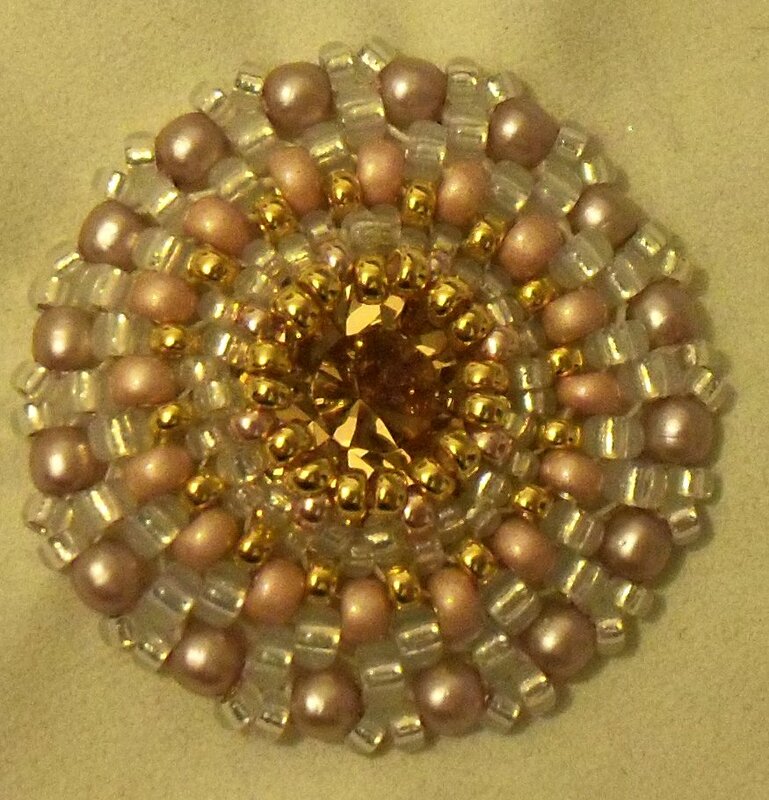 The chaton in this piece is surrounded by tiny 2mm pearls and dusky pink size 11s. 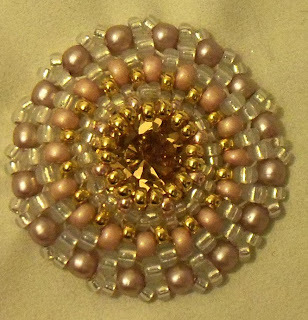 Somehow, it looks to be spiraling out from the centre of the chaton, which I really like. These are the remaining sparkles that I have left to attach to the backing, two of them have already been beaded around, but the others have yet to be started. I did go on a little sparkle-buying splurge, and bough some more crystals to go on the bag - two pale gold swarovski pearl cabs, some 24k gold plated fire-polish crystals, and some 3mm crystals in rose-water opal and crystal AB. 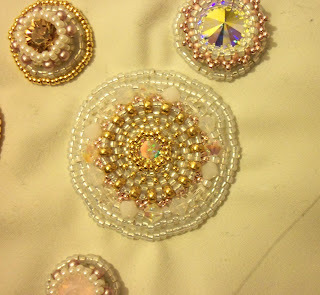 This bag is going to be so bling by the time I finish with it! This is my current progress... 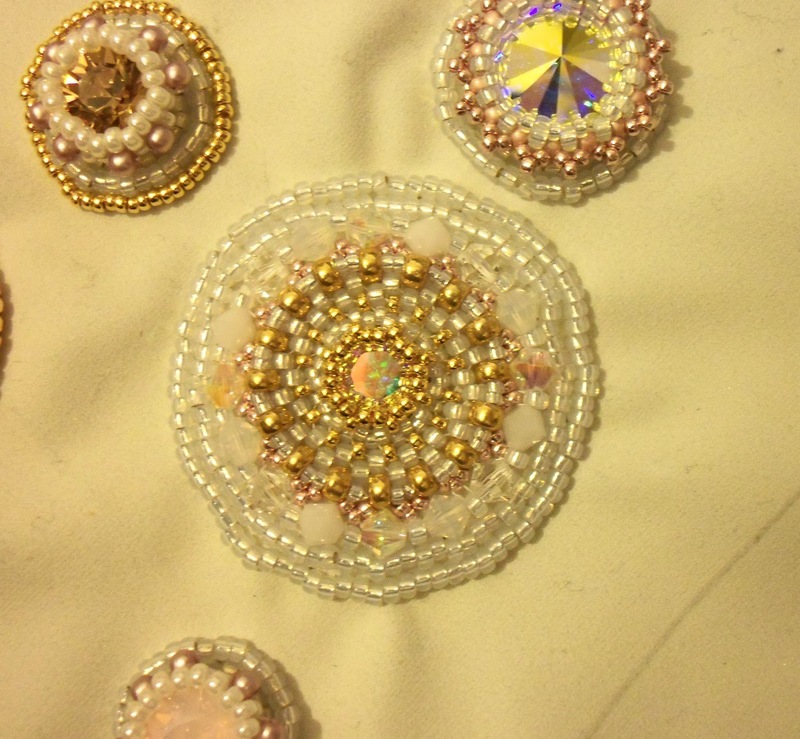 I really need to get going with it - every time look at it, I realise just how much beading there is to do between the sparkles!